Walz Label & Mailing Systems and CASI can serve as a source for all your custom robotic automation needs, utilizing our decades of technical knowledge and experience to objectively guide you through the complete range of technologies and design possibilities to provide an optimized custom automation solution. Our experienced system consultants allow you to reap the rewards of automation and reduce the risk by applying our vast technical knowledge base and expertise to analyze and develop an automated solution. The CASI pre-engineered system integration methodology eliminates weeks – if not months of integration schedules to avoid disruptive downtime typical of custom systems built “on site”. These advantages of integration methodology allow our customers to lower their risk and achieve real return on investment goals. ABOT™ box cutting systems automate the process of box opening. 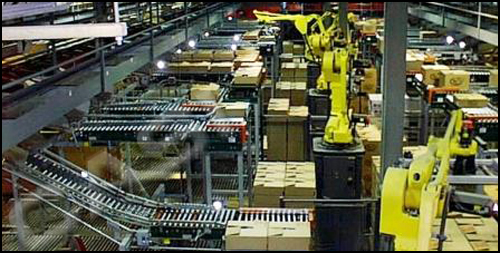 System adders include robotic depalletizing and decasing/emptying box contents CASI manufactures a case erector capable of handling random case sizes. Handles non-standard carton sizes without tooling changes. Walz Label & Mailing Systems depalletizing systems are top notch in controls and technology, yet low cost, greatly improving productivity and the bottom line. Robotic pallertizer systems are designed for end of line placement of finished goods to pallets for shipping. Palleting systems are cutting edge, yet low cost, greatly improving productivity and the bottom line. Pick and place systems are designed to remove touch labor assosciated with highly repetitive tasks to increase efficiency.